Nepal is a very beautiful country that is always bragged upon for its natural beauty as considered as heaven. It is attracts many tourists cause of the natural beauty it holds. Nepal is a very multicultural country and is influence by cultures of the neighboring countries. If you plan to visit Nepal and want to know the foods that they often reach for and the reason why it’s so raved by Nepalese, Here are ten most famous food among Nepalese people. 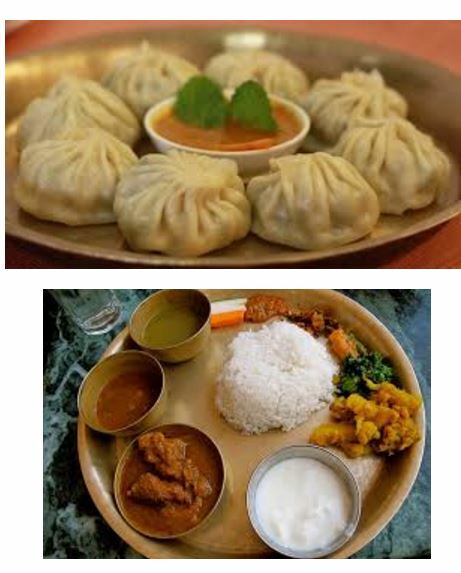 Momo:�No matter where you go, in any part of Nepal, MOMO is the most loved food in Nepal. It’s basically a dumpling. In Nepal you can find dumpling with different sizes, colors and different varieties. They are affordable and supper yummy. Its skin is made out of wheat and flour and fillings are made out of different meats, such as buff, pork, chicken, vegetables, paneer and also chocolate. It is companied by achar, that is basically chilly sauce which is different from one store to another and also many people prefer to have it with a soup. Also you can have your momo fried, steamed, kothey (half fried, half steamed), chilly and many more. Chowmein:�Chowmein are noodles with different choice of meat and spices and also different vegetables. Again it’s one of those affordable food that is found in every restaurant, cafes or even street vendors. The taste is unique from every store and Nepali people love them. This is basically most ordered food in Nepal after Momo. Chatamari: Chatamari�Known as Nepali Pizza, a Newari dish. It is basically a pancake made of rice flour with exotic toppings that are according to the choice of the costumer. It’s normally vegetables with egg and meat. Chatamari is normally accompanied with chicken curry or soup. This is a must dish in any occasion in Newari Culture. Once again this is very affordable and found in any Newari cuisine, restaurant and event street vendors. Saifale:�Same as momo, it is basically the same concept instead it has a thick skin which is fried and the outer rim or let’s just say the border has this interesting swirl or twist design to lock the filling inside. Fillings are of the costumer’s choice with any meat with onions and spices and vegetables. They are very affordable and easily available in any store or restaurant. Highly raved, super yum food with again is companied by achar which is different from place to place. Alu Tama:�Alu (Potato) tama (Bamboo shoots) is a traditional dish prepared especially in hilly regions. It is basically made out of fermented bamboo shoots with potato and black eyed peas. The taste is little sour but is very rich in flavor with refreshing taste. Daal Bhat:�As an Asian country, Nepalese people eat rice as a breakfast or dinner or sometimes even lunch. Basically they eat rice every day. �Bhat� is referred to rice and daal is basically a cereal that is soupy in consistency to accompany rice and with that there will always be curry, can be either vegetarian or non-vegetarian achar, vegetables, salads and other side dishes. This is handsdown any Nepalese favorite food. It’s in the culture what Nepalese eat every day and it’s not only cooked in restaurant but also daily in home or any kind of occasion, a must have dish. Chapati Curry:�Chapati is basically a flatbread made out of whole meal flour which is very hearty and best eaten with curries and vegetables also with achar and sometimes with daal also. There are also different varieties of chapattis you can have depending on what flour is used and also this is too eaten daily in most house in Nepal. This is extremely affordable and found almost everywhere. Thukpa:�It is a noodle that is cooked with a thick soup, best for winter and mostly cooked in Himalayan/ Mountain region of Nepal. Again one of those most ordered dish. This dish is seasoned with vegetables mixed with Himalayan spices with your choice of meat or one can simply eat vegetarian. This dish is of course cooked in most restaurant in Nepal but you might find a different range of thukpas that are cooked in Tibetan restaurant in Nepal. Sail roti:�It is the ancient dish that is cooked to especially cooked in Tihar. The main ingredients are rice flour with is watered down to the liquid form with some salt and sugar. This liquid is carefully poured to the oil that is under really high temperature in mostly circular in shape. It is eaten with either curry or mostly with tea or coffee. Newari Khaja Set:�Newari khaja Set is a traditional cultural dish for Newa (An ethnic group of Nepal). It is must in special occasion and Newari people have it almost daily. It consists of baji(flattened flakes of rice flour), bhuttan(Fried meat of buffalo), Choila( chicken or duck), roasted and smoked meat with spiced beans, egg, fish, potatoes and vegetables and also the special drink chyang or aila. It is basically a home/self-made liquor made of rice that has been fermented and is very popular.